GaryMoller.com - Health, Fitness - Naturally! : How can I lower my high arches? How can I lower my high arches? I came across your pdf for correcting collapsing arches online...I have the opposite problem..very high arches..approx 22mm. It is almost impossible to find shoes other than Moszkitos sandals. with arch support of 19mm..nevertheless..it is never quite enough. I have seen doctors..no one offers hope for changing my arches myself..I believe with the proper exercise I could lower my arches just enough to be comfortable in “regular” shoes..can you give me any direction with this? Wendy, I come across this problem now and then especially in people who do a lot of exercise such as running. When questioned they usually report their shoe size being less than it was in their early 20's, indicating that there has been a slow shortening of the tendons of the feet. Typically, the toes will appear bunched up, sometimes called "Hammer Toes" and the arch is unusually high. The foot is typically inflexible. The bunching and tightening appears to be due to the tendons and ligaments becoming short and tight causing the feet to become short and tight. Wearing high heels may make matters worse. 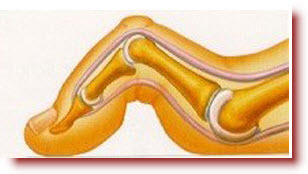 Shortening of the tendons and ligaments. Similar to Dupuytren disease. Shortening of the muscles in the feet and calf regions. The cause of the shortening of the tendons and ligaments is what I associate with extreme and unrelenting stress, both physical and psychological. This may include stress on body systems from accumulation of toxic elements such as arsenic, lead and mercury. Sources of these toxins include treated timber, pesticides, fungicides, exhaust fumes, some red lipsticks, firing guns, eating tuna and amalgam fillings. These stressors rapidly deplete the body of essential vitamins and minerals that are needed for the formation of healthy collagen. These same stressors may increase muscle tension and shortening. The first step to restoring healthy collagen is to determine if there are any toxins such as lead within the body and to find out if there are any imbalances of vitamins and minerals that may be contributing to muscle tension and poor collagen. I often suspect chronic iodine deficiency which is most severe in vegetarians. Blood tests, while useful, are insufficient. The most useful and comprehensive tool is the Hair Tissue Mineral Analysis which can be ordered through me. Commence a daily routine of stretching the feet and calf muscles. This must include sitting back on your heels Japanese-style. Get a firm once-weekly massage of the feet and legs. Walk barefoot on grass and preferably on sand at every opportunity. Identify all the stressors in your life and eliminate or minimise these one at a time. Thank you for writing in about this interesting topic. Readers are invited to contribute with their ideas and advice by posting comments below this article. I have had fallen arches all of my life and my feet have given me a lot of trouble. I was an athlete but now I can't do very much because my feet are sore on the bottom a lot. They ache at times. Contrary to your article, my feet have spread and are wider and longer. I there anything I can do? This should help halt the process and possibly reverse it. But it will be a long slow process. Like the journey of a thousand miles, it is best you start sooner than later and concentrate on just the next few steps at any time. There is also a link between chronic fatigue, often seen in "retiring" athletes, and loss of collagen elasticity. This may show as flattening arches and spreading of the feet. To explore that possibility further it will be necessary for you to complete a hair tissue mineral analysis which you can do through me no problem. I hope this helps Mike. Please give us an update later on no matter what you do.